Canmore is an excellent base for cross-country skiing due to the Nordic Centre which was build for the 1988 Winter Olympics. Tours which do pick up from Canmore include the Grotto Canyon ice walk , NHL ice hockey tours to see the Calgary Flames, scenic helicopter flights, snowmobile tours and some dog sled tours so there is still a good selection of winter tours to choose from. Most winter tours leave from Banff only and so you have to get to Banff in order to takes the tours. Banff is approximately 20 minutes drive from Canmore. 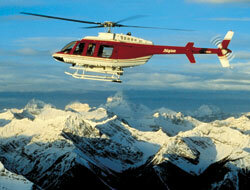 There is no way of getting to any of the ski hills from Canmore without having your own transportation. The ski shuttles from Banff to Sunshine Village, Banff Norquay and Lake Louise are included with the Tri-Area lift pass. Listed opposite are the available winter tours and activities to choose from which depart out of Canmore and we have listed additional tours which depart out of Banff for your reference. Some tours book up further in advance than others such as Banff Dog Sled Tours and the Banff Ice Hockey Tours. If you have a limited amount of time as to when you can take a tour, book in advance to avoid disappointment. Banff Ice Walk tours give you a unique view from inside a Canyon. There is more ice walking involved with the Grotto Canyon tour in comparison to the Johnston Canyon tour. Banff Snowmobile Tours are a fun way to see some beautiful backcountry. These snowmobiles, or "skidoos", are easy to drive with a finger trigger for acceleration and heated handlebars for your comfort. If the Canmore winter tour you are interested in is not listed above, please contact us and we will do our best to help.